adidas Consortium and Tokyo-based mita sneakers are teaming up for the first time since 2016 with an all-new “Cages and Coordinates” Pack. The pack debuts a brand new adidas NMD called, the NMD TS1 along with the adidas Stan Smith. The NMD TS1 features a Primeknit upper with a tonal mesh cage pattern that nods to the way mita displays their footwear styles. A Boost midsole with Blue and Green EVA insert overlays and front and back pull tabs completes the design. The Stan Smith comes in a Black premium leather upper with metal side-zips, heel tabs that are offset with White text running down the entire tongue and across the heel. Each text on the shoe represents the geographic coordinates for both the mita store in Tokyo and the adidas HQ in Germany. Look for the mita x adidas Consortium “Cages and Coordinates” Pack to release on July 7th at mita sneakers and on July 14th at select adidas Consortium retailers. 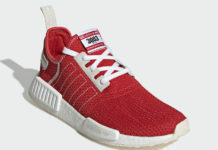 The retail price tag is set at $220 USD (NMD TS1) and $160 USD (Stan Smith). UPDATE: Here are detailed photos of both the mita x adidas NMD TS1 and Stan Smith from SNS.